Okay, so as my last blog states, I recently spent a weekend in Arizona. What that blog doesn’t state is that I stayed at a frat house that weekend. If only for the sake of my dear, confused Mother (who had no idea what this meant when I told her on Skype), I thought I’d give a quick rundown of what fraternities and sororities actually are and why you should care. [Disclaimer: you shouldn’t really care]. Without wanting to plagiarise the ever-trusty Wikipedia too much, I’ll direct you here for a more accurate and in-depth description of what the Americans term ‘Greek Life’. After doing some thorough research (see aforementioned Wikipedia link), it turns out that the first Greek Society was founded in 1776. As a top American Studies student, I can also tell you that 1776 was the first official year of American independent nationhood. Without wanting to bore you with too much of the history, I’ll get straight down to what ‘going Greek’ means in this day and age. 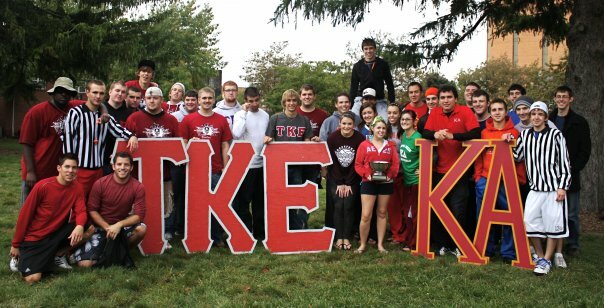 Fraternities are male-only societies, while sororities are their female counterparts, that undergraduate American students have the choice of joining during their time at University. These societies are based around charitable fundraising often intending to benefit the local community, sports competition amongst other frats, and socialising. One of the most significant benefits of joining a fraternity or sorority however, especially at the more respected American Universities, is the opportunities and connections it may engender for an individual once they emerge into the workplace. Indeed, everyone from Martin Luther King Jr. to Brad Pitt were members of a frat at one point or another in their college life. My experience of fraternities is severely limited however. Whilst I know of quite a few other English exchange students that have decided to ‘pledge’, or join, a frat during their time here, it doesn’t really appeal to me. Despite the social benefits – it does seem like an excellent way to meet people and is definitely a good way to party American style – you have to pay for your membership (usually hundreds of dollars worth) and the notorious initiation period (usually the first semester of your University career) as a Freshman is less than appealing, due to what is known as ‘hazing‘. Although, from what pledges have actually told me whilst I’ve been here, it doesn’t sound as humiliating as the movies often make it out to be. Personally fraternities come across as 50% beer pong and 50% excess testosterone, which can be fun once in a while I guess, but soon gets tiresome.